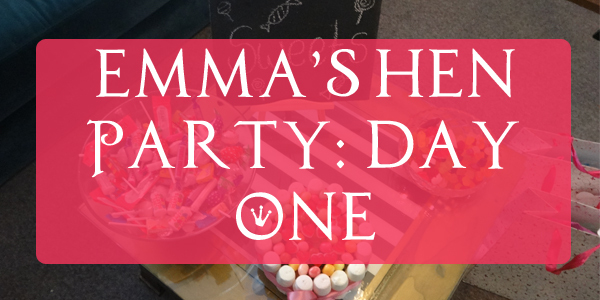 On July 1st, I embarked on a weekend to Brighton, to have some fun at Emma's Hen Party! Emma is Cameron's older sister for those of you who don't know! The planning was started by her bridesmaids, Alice S and Zoe, about 10 months ago! I agreed to go and I was super nervous the whole time while it was being organised and arranged! I'd essentially signed up to 3 days with my brand new boyfriend's family and a dozen of Emma's friends, after only dating him for a few months! I've thankfully got to know his relatives over the past year which helped a lot over the weekend - plus I now feel a lot calmer and laid back around them! Over the 3 days I got to spend with everyone, I had a really good time - despite making myself super sick for the days running up to it with a few mini panic attacks! As I was so excited about the whole thing at the start of the year, I wanted to share some pictures of the weekend with you guys, and I'll do a post for each day, as we were super busy all weekend! So let's kick off day one! We stayed in an Air B'n'B style house in Brighton, called 'West Pier House' and is big enough for 20 people! It had 4 bedrooms, 2 and a half bathrooms and a super gorgeous kitchen and living area. I loved that we were able to get 15 of us inside the house and was much more relaxing than a hotel! Alice S and Zoe had decorated the place so nice, with blue balloons and white balloons with confetti in them, cakes made of sweets and drinks were all set out before we drove the Bride To Be down there! I was sharing a room on the top floor with Vicky, Alice O and Kelly, who are Cameron's cousins and all sisters. I was so happy I was in the same room as the three of them as I've met them all a few times before and it definitely stopped me panicking so much. Plus I got to see how Vicky made her hair all wavy, so I learnt a new method! Alice S had also cooked a huge pot of Chili and rice for our dinner - yes for 15 people! - and it was so delicious! The bridesmaids had also made little 'hen party survival' gift bags for each of us. Inside was a few goodies such as sweets, party poppers, a bride tribe badge Alice had made, and other little items! It was such a good idea and I used a lot of my items! After dinner, we all changed into PJ's to play some games such as Mobsters, a mystery present game and a classic - toilet paper wedding dresses! I was on a team with Kelly & Alice O and Fiona, who is married into the same family that Emma is joining! I loved our little team - Team 2 - or as we were named: 'Super Awesome Unicorn Glitter!' We came second in the dress contest after making over Alice with what we all thought, was a classic dress! We made it until 1am and then called it a night! I sadly only slept for an hour and a bit, but I was still refreshed enough for day 2...! Which I shall tell you about in another post!